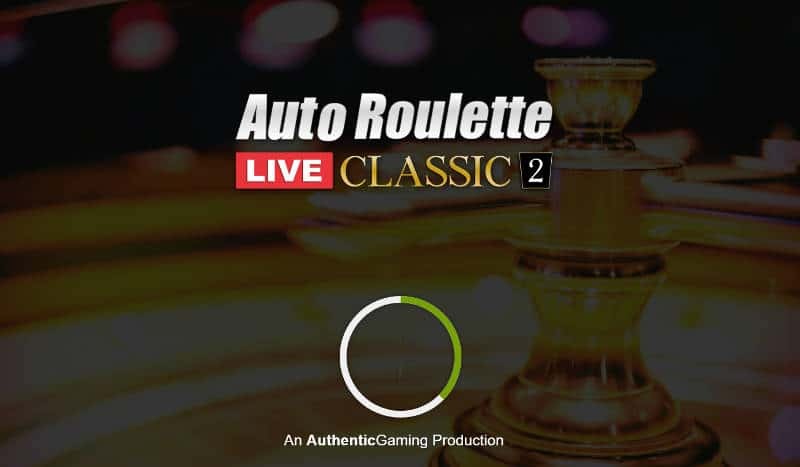 Authentic Auto Roulette 60 has been renamed to Authentic Auto Roulette Classic 2. It’s been renamed by Authentic to enable other changes to be made to their expanding Auto Roulette game portfolio. Game round takes 68 Seconds. Authentic Auto Roulette Classic 2 is one of the Live Casino roulette games offered by Authentic Gaming. This game doesn’t use a live dealer, but does utilises a real roulette wheel and is controlled using a computer and compressed air. These Automatic Roulette wheels are very common in land Based Casinos. This version of the game tends to suit players that like playing with a real wheel but want a quicker game than a regular table can give. You’re also able to place and control your bets more easily without getting in the way of a croupier or other players. The Classic 2 game has a betting time of 30 seconds. A full game round takes 68 seconds, which is 5 seconds slower than Auto Roulette Classic 1, and a full 13 seconds slower than Speed Roulette. One of the things that distinguishes Authentic Roulette games from their competitors is the attention to detail when it comes to the playing interface. There is every conceivable betting option you could ever need. Statistics are viewable up to the last 250 game rounds. You can see the win percentages for each number and the area of the wheel. Hot and Cold numbers are tracked and when every you see a statistic you can place a bet on it. Call bet types are listed and you can choose the number of neighbours when betting that way. A traditional racetrack can be displayed alongside the normal betting grid. You can save your favourite bets, repeat and double the last bets. For those that like to sit back and watch you can use the Auto Spin facility to repeat the same bets for a designated number of game rounds. There’s not much to add really. If you like Automatic Roulette this is a very good version. There’s others available, a few are listed here.